I have decided to switch to minimalism. Minimalist camping has probably not yet been given a clear-cut international definition. Its definition varies according to region. In some parts of the globe, an ax may be essential. In other places, a rifle or a shotgun should always be on the list. But in the Philippines, the list of equipment may be trimmed down as we have no problems with bears and snow. With this fluid definition of the term, one thing’s for sure: in minimalist camping, the camper should keep his gear down to a minimum. Others would only consider minimalist camping one in which the camper is able to deal with the barest essentials. This means you have to go into the wild and survive for about five or more days with minimum equipment. You make snares, you shoot moose, you fish and you keep your body warm. You pretty much have to be Alexander Supertramp. This doesn’t happen a lot in the Philippines if not among rebels and the commandos or those who have plans to be either. 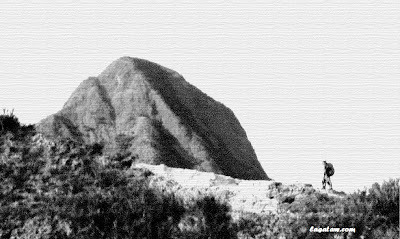 Among hikers (and self-proclaimed mountaineers) technology and the LNT principles have made this concept look quite unattractive. Why do you have to make fire out of two twigs for five minutes when a lighter can make fire in half a second? Why do you have to dig a hole in the ground to make a furnace and lay a bed of coal covered with hardwood when you can keep yourself warm in a -10°C sleeping bag? Technology and innovation have replaced these crude practices. And the LNT principles which some ‘mountaineers’ religiously follow have forbidden the followers to snap twigs off a tree, make camp fires and leave coal on the ground. I have nothing against bushcrafting because, in fact, I really respect and emulate the practitioners of this art and craft. Nor am I mocking the LNT principles or the ‘BMC’. I truly admire the principles but I really have to tie a guy line to a small shrub if that’s the only way to keep myself from getting soaked in the rain. And I really have to play a Jack Johnson playlist when I get damn bored with the perpetual buzz of the cicadas even though that would mean disturbing the peace of the habitat for some purists of the BMC. I am just being an average Joe. An average Joe either doesn’t know how or is plainly not willing to make fire without a lighter or a match. And an average Joe leaves toilet paper in a failed cathole. An average Joe just wants to have fun while climbing. And an average Joe doesn’t have a complex and sophisticated definition of minimalist camping. So here, an average Joe is laying down his OWN standards for minimalist camping in the Philippines. The primary reason why one would want to be a minimalist is the weight he would carry while trekking. A minimalist wants to enjoy the whole journey including the bus trip and the actual trek. He avoids the hassle of stowing a lot of stuff in baggage compartments when travelling and the hassle of carrying a lot of weight on his shoulder while trekking. In line with the objective of keeping the weight to a minimum, a minimalist camper brings less stuff. The minimalist avoids redundant and extraneous items on his to-bring list. He focuses on function more than on form. A minimalist may use rocks, twigs and trees as stakes to do away with the weight contributed by metallic pegs. A bivvy (which requires fewer components) can substitute for a tent. A headlamp can make a lantern unnecessary. Now this addition to the meaning of minimalist camping may be repugnant to the purists of the practice. So I would rather call my practice modern minimalist camping or minimalist camping in the Philippines or minimalist camping for the average Joe. The ultra-conservative concept of making fire is just not practical among modern campers in this modern age. In fact, I have eliminated the necessity of fire in my camp trips. However, I must admit, a skill in bushcrafting is always an advantage when in the wild. You never know, those pieces of technology, such as lighters, may fail. But a modern minimalist utilizes technology to replace some rather tedious practices such as making fire out of wood. He brings along a fabric for his shelter in the form of a tent or a bivvy rather than rely on coconut leaves to set up makeshift shelters. He eliminates the necessity of hunting by bringing along his own food. Hunting and cooking meat may be replaced by ready-to-eat jerkies. This way, he makes the BMC purists happy too. But it is always better to be self-reliant than purely technology-dependent. The more people, the more chances the other criteria (e.g. weight and amount of stuff) are not met. When many people join a climbing party, stuff can be distributed among the members to minimize the weight of each backpack. This is cheating. The objective of minimalism is to be self-reliant. And hiring porters and guides goes against the idea of self-reliance. The idea is to survive in the wild alone or with one buddy for a couple of days. Self-reliance, as I mentioned above, could also mean being able to survive when all else fails (e.g. technology and weather). There is no limit to the price. If the camper is rich enough to buy a very expensive knife it is still just a knife at the end of the day. It is not the collection of expensive top-of-the-line blades that matters to a minimalist. It is his ability to utilize any cutting tool such as a bamboo stem or a rock. An expensive blade in a glass case is nothing compared to a bamboo blade that was used to kill a bear. Conversely, a wooden blade used just to impress others of his craft is nothing compared to a Victo Rinox used to slice a piece of meat. It doesn’t matter which brand of pack the minimalist uses. What matters is the ability to turn a backpack into something functional. The price of the food he consumes doesn’t matter either. It is not a requirement to hunt deer and rabbits in the wild in order for a camping trip to be considered minimalism. It is the function that matters. Not the price. However, even if the other requirements are satisfied, a day hike could barely be considered minimalism in my book. Minimalist camping should involve camping overnight or spending some time in the wild. A day hike can be considered as a simple visit to the campsite. 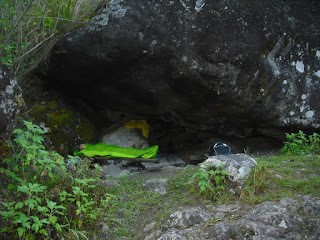 My first taste of minimalism was when I spent a night in my sleeping bag under the canopy of a boulder near Eddet River (in Mt Pulag). 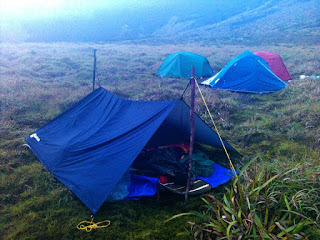 It is not ideal to sleep in the premises of Mt Pulag Natural Park without the protection of a tent or a better shelter. The first time I climbed Mt Pulag was the exact opposite of what I did in November, 2011. When I first climbed Mt Pulag, my 40L-backpack was almost burst by bulky stuff including a heavy frying pan with a fixed handle. That was my first packing for a major climb. As time went by, I was able to buy less bulky and lighter stuff that’s why I was able to survive Mt Pulag with just my Columbia Mobex last November. My latest minimalist trip was last August in Mt Lanaya (Cebu). During that solo trip, I did not rely on a boulder for shelter. Instead, I had to set up my first bivvy. But I still had to rely on a tree for anchorage and for protection from the wind. I discussed this trip in detail in this post. My next mission is to go minimalist and not rely on a rock or tree for shelter support. But if you really think about it, part of the essence of minimalist camping is to rely on nature for shelter and food. Most minimalists would want to camp in a vegetated area. I think wide bare campsites are for the regular camper. But I’ll still give it a try anyway. I love the idea of setting up an A-frame shelter on the ground and not getting wet when it rains. It somehow makes the trip more of a feat than just some random adventure. The Philippines has a lot of unexplored areas. With the thick vegetation and interesting fauna of our tropical rainforests, minimalist camping could be a load of fun and adventure. With minimalist camping one is able to test his limits on a different level. He is able to test how far he can go and what he is willing to do in order survive like Bear Grylls minus the crew. He learns to enjoy the trip even without the fun derived from a companion and merriment. And most importantly, he learns how to appreciate nature more. He delves into the wilderness a stranger—no family, no home no friends—lower than the ants working in harmony beneath the dried leaves and twigs he treads upon. Then once he’s there, he learns the rules of the habitat he has delved into. He learns to appreciate and adapt to another kind of life—a life devoid of human society and norms! Then he leaves the place refreshed, renewed and reborn! Minimalism has a lot to offer to the Filipino camper! It can make you forget about all your troubles for a while and discover that fun is not derived only from friends and ‘socials’—and that indeed, man can be an island! Thanks Sir Jing for the time and the comment. A compliment means a lot if it's coming from you. i agree with you sir! 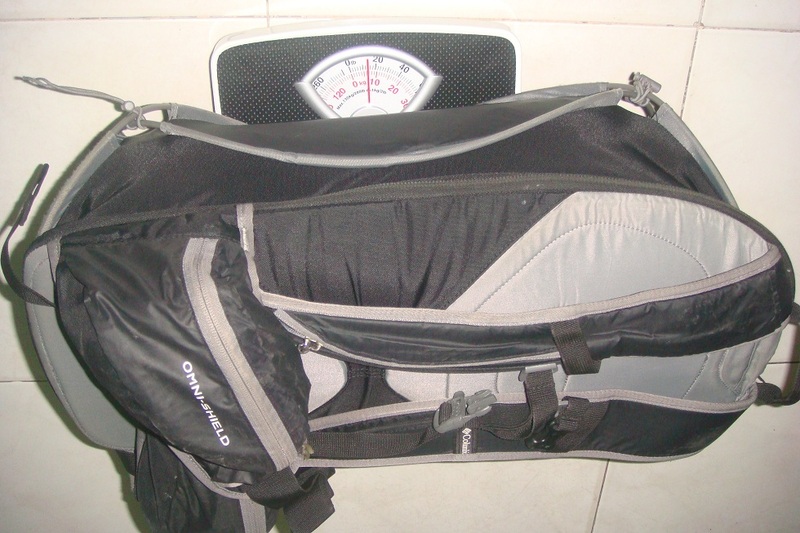 i started with 65L down to 35L and right now 28L backpack ang ginagamit ko during my 2-3days hike. Brilliant work Sir! My dad is in Cebu right now and I'm planning to visit there January next year. grabeh! i cannot imagine myself go hiking in a mountain all bymself, bt I totally agree with that modern minimalist definition youve conceived.